Congratulations to Fleet Capt. Sidney Riley and Commander Darius Clack for “LtJG Katherine Sharkey and Laeni: Children are like a pack of wolves”, the Round 7 winner, which is continuing on to the semi-finals at the end of the year. Voting for Round 8 submissions is now open, so pop on down and vote! It’s the closest thing to actually being in space. This amazing tour of the International Space Station, hosted by Jeff Williams, has been posted in glorious high-definition video for your viewing pleasure. Jeff gives an amazing tour of the International Space Station, complete with rocking music during a “fly-through” of the main superstructure, and then a tour from Soyuz to Shuttle. It really shows just how vast, cramped and maze-like the whole structure is. Check it out! This is what most of space looks like. This is the second in a series of articles regarding common misconceptions about space. The first of its number dealt with the vast distances involved when considering space, and this one will deal with the idea that “Space is cold”, and about space nebula. Even Star Trek’s writers almost always got nebulas completely and utterly wrong. Voyager… I’m looking at you. Ahh, what a wonderfully misunderstood place space is. Although the function of UFOP: Starbase 118 is to write Star Trek fanfiction, we don’t require any Trek or space travel knowledge at all. In fact, coming into the group as a “clean slate” means that you’re in the unique position of designing your own character, completely from scratch, without any influences or constraints or preconceived notions. That said, there’s a lot about space that even the most ardent sci-fi fan incorrectly assumes, and these articles are designed to correct some of the common misconceptions regarding space. 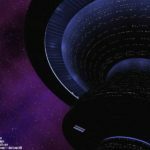 But much like a new UFOP: Starbase 118 writer who joins us without any Trek knowledge, knowledge of how the great void works is also not a job requirement. Although some on-the-job training every now and then can’t hurt. On with the show! #1 – Space is big. Space is very, very big. Congratulations to Elisa Kolk (AKA Karynn Brice) and Jack Kolk (AKA Mister Syrol) for the Real-Life birth of their first son, Macarius “Mac” Kolk! He was born at 02:38 on Oct 6th! And he is the cutest baby ever! With the promotion of Commander Jaxx to Captain Jaxx, there’s one more surprise in store for the crew of the USS Victory: reassignment! Whenever a player in UFOP: StarBase 118 reaches the OOC and IC rank of Captain, they are permitted to choose their preferred command. Accordingly, Captain Jaxx has selected StarBase 118: Operations as his command. The Victory herself will be replacing the USS Tiger as the station’s dedicated support ship, allowing the crew to venture off the base when duty calls them away. We all wish Captain Jaxx and his crew the best with his new assignment!